Paradigm Leads Design Thinkers at Make-A-Thon. 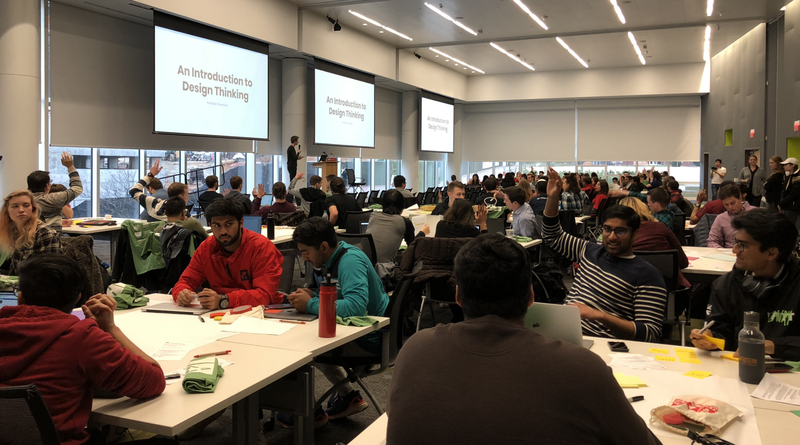 On February 1st, approximately 127 students participated in the third annual Make-A-Thon contest at North Carolina State University, which consisted of researching, designing, prototyping, and building, a sustainable solution. To kickstart this 3 day challenge, the Paradigm team was invited to host a strategic design workshop led by Ben Markoch. During the workshop, students were introduced to Paradigm’s Design thinking process. Ben explained the value of approaching solutions by asking the right questions. For example, at Paradigm, clients will exclaim their eagerness to jump into a project such as building a mobile app. But it is important to take a step back and ask “why” to ensure the root of the problem is addressed. Students worked through an exercise of first initially finding a problem, reidentifying it, developing solutions, and then evaluating the effectiveness of their solutions. It was cool to see many unique ideas reflected from the diverse spread of majors participating. “It’s neat because Make-A-Thon lives outside of a single university department; it brings people together around mission of a more sustainable world,” says Haley Huie, director of the Albright Entrepreneurs Village and member of the Make-A-Thon planning committee. Haley feels that students gain lots from industry experts and this event could not be possible without its supporters. She hopes students participating in Make-A-Thon feel more empowered to pursue innovative ideas and are aware of the resources available on the university campus and throughout the community. Paradigm is eager to see how Make-A-Thon will open the doors for a new generation of innovators. To participate in future design thinking workshop or learn more about Paradigm, visit our website. Like, comment, and subscribe to The Catalyst for the latest scoop where we feature stories about people, products, and brands who are reimagining the way we live, work, and play.